Vice President, Consumer and Market Insight for Europe, North America & LATAM at Unilever. 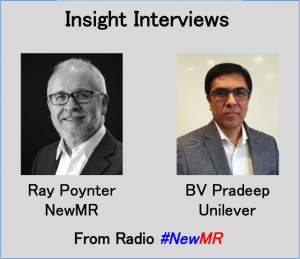 Listen to the latest #NewMR podcast interview with a leading client-side insight leader about the future of client insights. Access the slides and recordings from this recent #NewMR webinar by visiting the Play Again Page. 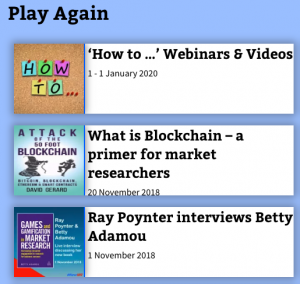 You can access the slides and recordings of our webinars back to 2010 from our Play Again page, or you can use search (by clicking on the magnifying glass in the top right of this page) to look for specific topics. 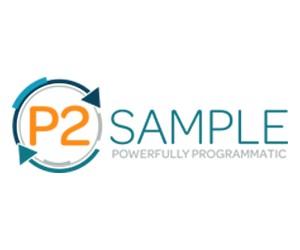 Guest post by Further’s Barney Larkin looks at how a US Insurer used an insight community to research and motivate their sales team. NewMR organises online events, this website & the LinkedIn NewMR group. NewMR is managed by Ray Poynter & Research Strategist & Chief Curator Sue York, & is operated by The Future Place. To read our Data Privacy and GDPR statement, click here. Keep in touch by signing up to our mailings. NewMR.org is funded by donations & sponsorship. Our 2018 sponsors are Gold Sponsors: Infotools, QuestionPro, Watch Me Think, Confirmit, Further, P2Sample, Netquest, conjoint.ly – Silver Sponsors: MRII, AMAI Mexico, MESH Experience, Lightspeed, Happy Thinking People – Communications Sponsor: Keen as Mustard.